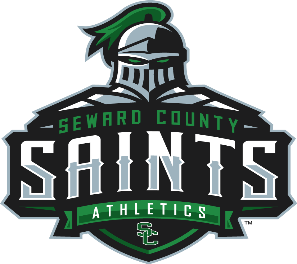 ARKANSAS CITY, Kan. – It was a tough afternoon for the Seward County softball team (4-6), as they got swept on the road against Cowley, losing 5-3 in game one before dropping the second game 16-6 in five innings. Monique Ashley (4-3) started in the circle, pitching 6.0 innings, giving up five runs in the loss. The Lady Saints came away with only three hits on the game, coming from Jullian Atteberry, Madeline Owen and Kaitlin Ammermann. Atteberry brought home two runs. Neither team could get anything going until the fourth inning. Cowley’s Heidi Nitsch led off with a walk and reached second with a sacrifice bunt by Randi Hamilton. Kacia Hilty doubled to left field with the next at-bat, bringing home Nitsch. Two walks later put runners at first and second for the Tigers. Sammie Murray brought home one run with a fly ball to right-center field. A fielder’s choice with the next at-bat scored another run, bringing the game to 3-0. Cowley retired the side in the top of the fifth and started where they left off in the fourth. A bunt back to the pitcher put a baserunner on for Nitsch, who tripled to to left field to make the score 4-0. Hamilton got hit by the pitch with the next at-bat, before Hilty hit a ground ball to second base. An error by Ammermann allowed Nitsch to score to make the game 5-0. The Lady Saints finally had an answer in the top of the sixth. Sage Harrison reach on an error. Two batters later, Atteberry homered to centerfield to bring the game to 5-2. Seward ented the seventh inning down three runs, but quickly loaded the bases from a double, walk and error. Harrison grounded out to shortstop to bring home one run, but Raelyn Sanchez struck out with the next at-bat to end the game, 5-3. Errors doomed the Lady Saints in the second game, finishing the game with five. Jordan Cordrey (0-3) pitched 2.2 innings, giving up six runs, but none of them were earned. Corrina Porras and Sydney Epp came in for relief, giving up 10 runs, with six of them being earned. Seward was much better at the plate in game two, finishing with 10 hits. Atteberry, Sanchez, Leena Mortensen and Paige St. Pierre all finished with multiple hits, while Harrison came away with three RBI from her fourth inning home run. The Saints got on board first in the third inning from a wild pitch. Atteberry doubled and proceeded to steal third base. The third strike on Sydney Epp got away from the catcher, allowing Atteberry to reach home. The game quickly got out of hand form there. Two Tigers reached bases from errors after a leadoff pop out to left field. A double steal put both runners in scoring position before the batter struck out. With two outs and runners on second and third, the Cowley clinic began. Nitsch singled to right field to score both runners to make the game 2-1. Hamilton singled to centerfield, advancing Nitsch from first to home. A walk with the next at bat put two runners on base again for the Tigers, before LaTaylah Perez homered to left field to make the game 6-1. Two straight errors brought another run home. A single scored another run, before Brianna Fuchs triple to complete the nine-run inning by the Tigers. A double by Leena Mortensen and a walk drawn by St. Pierre put runners at first and second for Harrison in the top of the fourth. Harrison made the most of the opportunity hitting one out of the park to right field to make the score 9-4. Cowley led off the bottom of the fourth with a double, before the next two batters reached from a walk and hit by pitch. Two straight loaded bases walks, brought home two more runs to make it 11-4. With the bases still loaded, a Tiger was hit by a pitch to brink the game to 12-4, while the next batter was walked again to make it 13-4. An error with the next batter scored two of the runs, before a double emptied to bases to make the game 16-4 in favor of Cowley. Needing runs to keep the game alive, the Lady Saints got runs on first and second from a walk and single, following a lead off ground out. Harrison flew out for the second out of the inning. A single by Lexi Manyik loaded the bases for Raelyn Sanchez, who singled to right field, scoring two runs. Atteberry grounded out with the next at-bat for the third out, ending the game in five innings, 16-6. Seward will host their home opener on Sunday (Feb. 18) with a double-header against Lamar beginning at noon at Lady Saints Field.